Fascinating Turkey Culinary Tour 2015 ; October 25th - 30th, 2015. Turkish cuisine provides healthy, hearty, delicious food for family and friends. This delicious and easy to make Turkish crunchy pancakes with pistachios and clotted cream, Katmer, hails from Gaziantep, one of the must visit gastronomic regions in Turkey. The crunchy, flaky Katmer is traditionally the first meal eaten by the bride and groom after their wedding night in Gaziantep. It tastes absolutely heavenly with Gaziantep’s world famous pistachios and the thick Turkish clotted cream, kaymak. 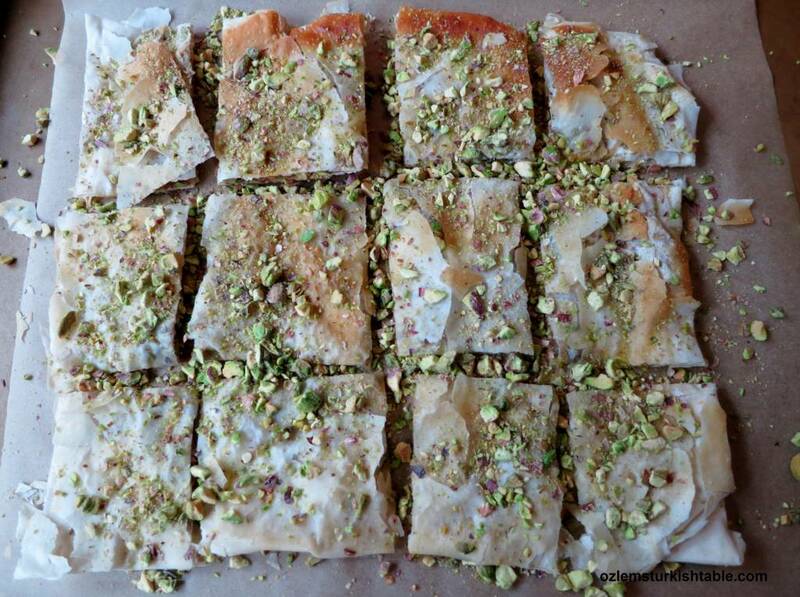 Place little dabs of the clotted cream, mascarpone cheese or Turkish kaymak, all around the filo sheet. 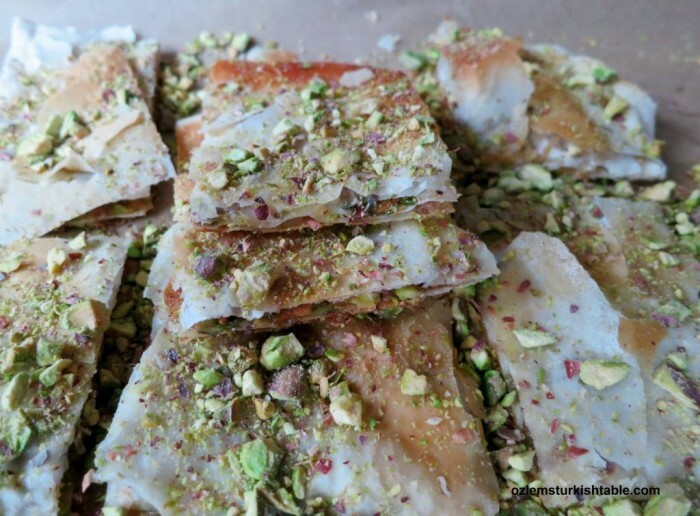 My version of Katmer here uses filo pastry sheets (you can use the fresh, paper thin Turkish yufka pastry sheets in Turkey) and thick clotted cream instead of kaymak, as it is not easy to find kaymak abroad (mascarpone cheese also gave good results). The substitution worked well in Katmer and made a lovely, light dessert with with fresh fruit by the side. You can serve Katmer as part of breakfast, dessert or as a tea time treat. Katmer, Turkish crunchy pancakes with pistachios and clotted cream, a specialty of Gaziantep. This delicious and easy to make Turkish crunchy pancakes with pistachios and clotted cream, Katmer, hails from Gaziantep, one of the must visit gastronomic regions in Turkey. It is delicious as part of breakfast, tea time treat or a light dessert with fresh fruit aside. Take the filo sheets out of the fridge 30 minutes prior using to bring to room temperature. If filo sheets are frozen, it is best to thaw in the fridge overnight and take out 1 hour prior using to bring to room temperature. Alternatively, you can take out the frozen filo sheets 2 hours prior using to bring to room temperature. Place two filo sheets on top of another on a dry surface (keep the rest of the filo sheets under damp towel so that they won’t dry out). Leave a margin of about 4 cm (1.5 in) around the edges and place little dabs of the clotted cream, mascarpone cheese or Turkish kaymak, all around the filo sheet. 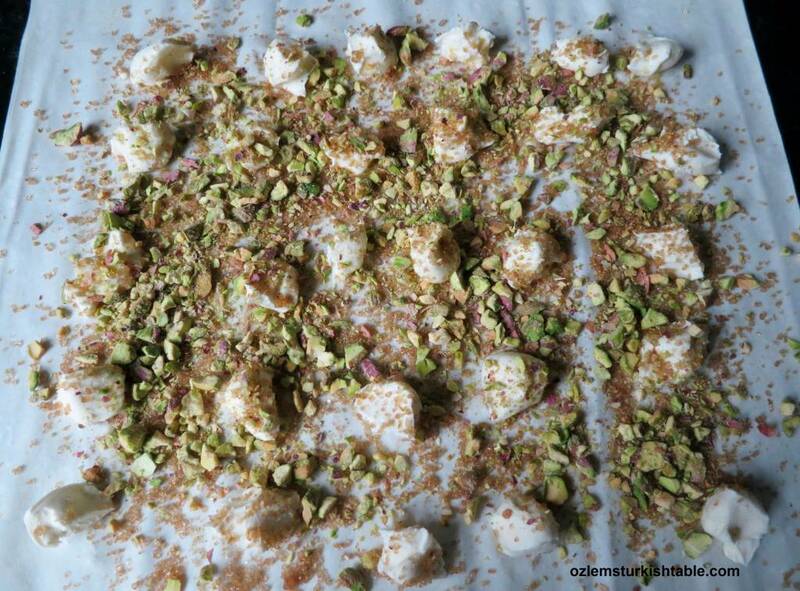 Sprinkle the finely crushed pistachios and sugar evenly over the cream. Place the remaining 2 filo sheets on top. Brush the edges of the top filo sheet with 1 tbsp. of melted butter. Wet your hands and fold over each side of the pasty (about 2 cm / 1 in) to make a parcel. Seal the edges with your wet hands and the brushed melted butter. Coat the remaining 1 tbsp. melted butter around a large, non-stick frying pan, over medium heat. Place the filo parcel into the pan (with the wrapped edges down) and cook for 2 minutes, as it will get golden. Turn the pancake over gently (large spatulas help) and cook for another 1,5 minutes or until golden. Serve katmer warm, drizzled with a little honey (if you wish) and crushed pistachios over. Bowl of fresh fruit aside complements katmer beautifully too. Merhaba, this is Ozlem. I am a native of Turkey, and passionate about my homeland and the healthy, delicious, Turkish Cuisine. I hope you enjoy my recipes here and I look forward to hearing from you – Afiyet Olsun! Festive Offering for My Online Turkish Cookery Course – 50 % Off! Lovely looking, simple and delicious. Love the idea of these as a dessert. Must be a bit messy to eat unless you’re careful – I’m rarely careful. A perfect dessert for the season, Ozlem. Just a tray of these crisp creamy treats would liven up a party:) great recipe. xxPeri. . . what are you doing to me? You know I can’t eat this stuff! Oh, alright then, just one more piece! I cheat a bit and put a single sheet of film on the bottom of a buttered waffle iron or machine, add ingredients and put another sheet on top with a bit of butter and put the lid down. As long and there isn’t too much filing, it’s a less fiddly operation. I’ve had cream all over my shoes a couple of times so I know now not to press to hard on the lid. When do you cut it, before you put it in the pan or after? Leave a Reply to Ozlem Warren Click here to cancel reply. Ozlem’s Turkish Table Cookery Book – Signed Copies! Welcome to Ozlem's Turkish Table (or as we say in Turkish, "Hosgeldiniz"). I was born and bred in Turkey, and lived there for 30 years. I feel very fortunate to be a part of this rich and welcoming culture. Turkish cuisine is healthy, delicious, affordable and most recipes are very easy to make. Here, I would like to show you how you can recreate these wonderful recipes in your own home. Living in England, I also cook other Mediterranean inspired dishes and some wonderful sweet treats. I hope the recipes may inspire you to have a go! Subscribe to Ozlem's Turkish Table and receive new blog posts by email. Or, grab the RSS feed if you like to use your RSS reader. Ozlem’s Turkish Table to Bodrum, Texas, Divertimenti-London! © 2019 Ozlem's Turkish Table. All Rights Reserved.